If you're an avid gamer and want to share your gameplay with the world, get feedback on your skills, and trade video game stories with others, the easiest way to do this is to record yourself playing and then upload the video to YouTube. This type of video has its own category, called Let's Play or LP. While newer models of the PlayStation and Xbox have automatic video recording features and let you easily share videos to the internet, they can't really replace high-quality, well-edited videos that people record and upload themselves. If anything, they have just flooded social networks with lots of terrible footage that no one actually wants to watch. If you're interested in producing actual video-game-related content to share on YouTube, though, viewers are always interested in seeing it. Producing high-quality videos isn't actually all that difficult, so long as you have the right software and hardware ready to go. You need the correct hardware to record the gameplay and the right software to edit the video before you share it. This guide will show you what you need to record quality Let's Play game videos, and provide some step-by-steps on recording and editing them. When we say "video game content for YouTube," we're talking footage like Rooster Teeth's "Red vs. Blue," Achievement Hunter videos, Game Grumps, and TheSw1tcher's "Two Best Friends Play," to name just a few. Your first step in making a Let's Play video is an obvious one: picking the right game the record. If you're making your game video for fun and to share with a few others, you're probably going to choose your favorite games. However, if you plan to monetize your videos, you will want to think about which games will attract attention and drawn an audience. The games you record yourself playing should be visually interesting in some way—even if it's for how terrible the graphics are, for example. You'll want to avoid games that are very repetitive, because these can bore your viewers. Extremely popular games will have a lot of videos dedicated to them on YouTube, to the point that YouTube is saturated with them. New gameplay videos of Minecraft, for example, are going to have a very difficult time getting noticed for two reasons. First, your Minecraft video will face competition from thousands, if not tens of thousand (or even more) of other Minecraft videos out there. It will be very difficult to get noticed in this sea videos. Second, with saturation there will inevitably come audience fatigue. Fresh takes on a game like this can be hard to find, and people will tire of them. One of the main pieces of hardware you need, especially if you're recording from a console such as a PlayStation 4 or Xbox One, is a video capturing device. This allows you to record the video output of the game and store the video file on your computer. Some gaming consoles have protections in place that make it a little harder to record your gameplay. Be sure to read what your video capturing device has to say about your console to ensure you have all the appropriate hardware and software components required to record the video. Also, check out a full guide to the basics of capturing gaming videos for YouTube. Some video capture devices support a microphone for live commentary. Video connection types include HDMI in most case, with some supporting component or composite connections. The recording quality, particularly for producing YouTube videos, is fairly even among all of them. These devices are worth the cost if you want to make high-quality videos. See a ranking of some of the best gaming video capture devices. Adding your own audio comments to your video requires a microphone. You can use an internal microphone on your computer, or the mic on a gaming headset; however, if you want a better, more professional sounding audio, you'll want to get a USB microphone. A popular choice among podcasters and many video producers on YouTube is Blue's Snowball mic for around $50 (2018). You can also step up in quality and go for the Yeti Studio, also from Blue, for about $130 (2018). While any microphone will record, you'll usually get better quality with a higher-end device. For example, the quality produced using the Blue Snowball is much greater than anything you can make with the built-in mic already installed in your laptop. Other high-end microphone options include Audio-Technica AT2020USB+ Microphone and the Editors Keys SL600 USB Microphone. We recommend recording your voice audio separate from your video. Though video recording software does let you record voice audio, too, recording your commentary separately with Audacity software, for example, will give you greater control and options during the editing process. A pop filter (also called a pop guard, pop shield, and pop screen) is a simple filter that attaches to your mic to prevent the popping sounds that can be caused when fast-moving air hits the mic when you're speaking into it. They diffuse and deflect the rushing air caused by pronouncing sounds like "p." Pop filters can also keep spit from getting on your mic. Pop filters come in a variety of types, from foam caps that fit over your mic to nylon or metal discs that sit between the mic and your mouth. Costs vary, but they are generally affordable. Even cheaper pop filters will improve your audio recording over having no filter at all, so if your budget is small go with a cheaper one. If you will be recording and inserting video of yourself as you play, such as with an inset picture-in-picture, you will want to avoid the larger disc-shaped pop guards because they tend to block the view of your face. Good choices for pop filters include the WindTech PopGuard 2000, Stedman PS101, or Dragonpad USA 6" Microphone Studio Pop Filter. A mic boom may be useful depending on your setup. A boom is an adjustable arm that can be attached to your microphone and positioned more easily for recording your voice. You can often find microphones, pop guards, and mic booms bundled together that can save you money and give you everything you need for professional recordings all in one package. RAM: You don't need a high-end gaming computer to do some video touchups, but it isn't uncommon to need upward of 4 to 8GB of RAM for some video processing. Hard drive space: If your game is hours long or high resolution (especially 4K quality), or both, it can take up an enormous amount of storage space. Consider getting another hard drive, such as an external hard drive, if your main drive has only a small amount of free space. The need for internet access is obvious, but a fast connection with good bandwidth is recommended. Internet service often quotes its download speed, but you may not find the upload speed as boldly advertised. This is because upload speeds are slower—sometimes significantly slower—than download speeds. You're going to be uploading your game video, so the upload speed will become more important for you. It will determine how long it will take for your videos to go from your computer to YouTube. For example, if your maximum upload speed is only 5 Mbps (0.625 MBps), it will take a full two hours to upload a 4.5GB video file to YouTube. Your video capture hardware may come with software for recording your game, but it might not have all the features you're looking for if you want to produce a truly professional-looking video. A free option for recording video is Open Broadcaster Software (OBS). This is a popular open source application that is designed for game capturing. You can choose from a huge offering of both free and commercial video editing software. Versions of Windows that have Windows Essentials installed can use the built-in Microsoft Movie Maker app for light editing, and macOS users can use iMovie. You might also consider more advanced (but not free) software, such as VEGAS Pro, Adobe Premiere Pro, or MAGIX Movie Edit Pro. You can use a free program like Audacity to edit the minute details of the sound file, and then encode it in the audio format your video editor requires. Audacity is perhaps the most popular audio editing software among YouTubers and podcasters, and for good reason; it offers huge number of features and options that make audio recording and editing very easy. Recording clear and coherent commentary while playing a game live is not as easy as it may seem and can take practice. To avoid silences, or "dead air," you can record your audio commentary after you record the video, and then edit it together. A video capture device works by interposing itself in the video signal from your gaming system to your TV or monitor. 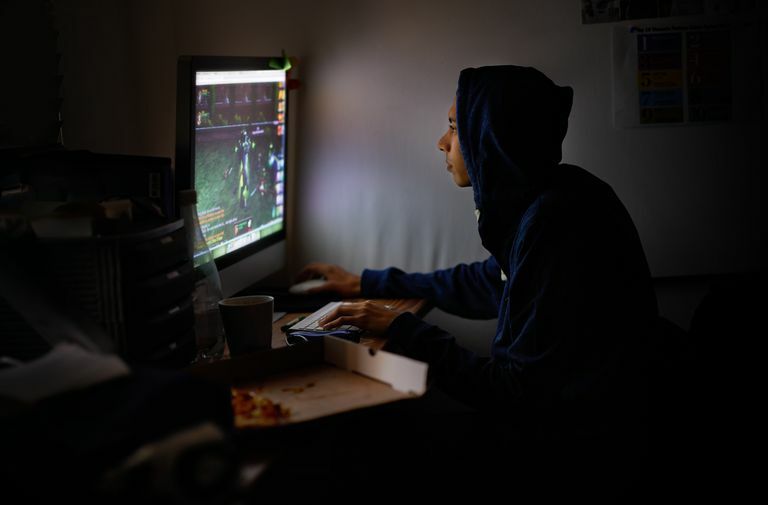 The device then allows you to connect a computer, with a USB cable for example, and feed the video simultaneously to your computer where the video capture software records it—all without interfering with your gaming. As an example, here is how you would connect the Elgato Game Capture HD60 S to an Xbox One to record video. Install the Elgato Game Capture software on your computer. Plug an HDMI cable into the HDMI OUT port of the Xbox One. Connect the other end of the HDMI cable to the IN port on the Game Capture HD60 S.
Connect a second HDMI cable to the OUT port on the Game Capture HD60 S.
Plug the opposite end of the second HDMI cable into your TV or monitor. Connect the USB-to-USB-C cable to the HD60 S, using the USB-C end. Connect the opposite end of the USB cable into a USB 3.0 port on your recording computer. When you record your commentary, your microphone may pickup subtle background noise. Here is a step-by-step on how to clean up an audio track in Audacity and eliminate background noise. Click the Recording Device dropdown menu and selecting the microphone you are using to record your commentary. Click the Recording Channels dropdown menu and select 1 (Mono) Recording Channel. For vocal tracks like game commentary, it is best to record in mono rather than stereo. Stereo recordings will shift with your position. This can be distracting for the listener. Click the Record button and start your commentary. Leave a span of silence at the start of the recording a few seconds long. When you're finished recording, click the Stop button. Left click at the start of the waveform and drag to select only the span of silence at the start of the recording (don't include any of your voice recording in the selection). Click Effect > Noise Reduction. Click Get Noise Profile. This samples the selected portion of your audio track so Audacity can clean up background noise. Select the entire audio track by clicking the audio track details to the left of the waveform. Click Effect > Noise Reduction again. In the Noise Reduction window, don't change any settings. Click OK. If your video or audio data needs to be in a different file format (e.g., you need the video to be an MP4 instead of AVI file or the audio to be in MP3 format instead of WAV), try using a free file converter program. When you have your gameplay video and your commentary audio ready, your next step is to combine them into a single video file that you will upload to your YouTube channel. You can do this in the video editing software you've chosen, such as iMovie, Adobe Premiere, or other software. When you publish videos to YouTube, there are some important considerations to keep in mind and mistakes to avoid to keep your videos visible, and potentially keep them earning you income. In the distant past, copyright issues were a huge minefield when it came to making gaming videos for YouTube, but things have changed. Many game companies have issued blanket statements allowing gamers to create and even monetize videos, with few restrictions. However, you still have to be mindful of copyrights. This is especially true with respect to any music you might use in your video. Make sure you're fully aware of the sounds your video has; don't simply add a song you like during the editing phase without checking its copyright restrictions. YouTube might strip it from your video before it's even published. What's more, if your video doesn't comply with YouTube's Terms of Service, it's Community Guidelines, as well as its Adsense Program Policies, your video will likely be demonetized. If YouTube demonetizes your video, it will earn no ad revenue for you. Obviously, if you want to make money from of your creative game video work, you'll want to avoid running afoul of these policies and getting demonetized.